A wonderfully preposterous combination of action and parody. With vampires. Tim Cheung is a "typical" Hong Kong teenager, who lives with his half-crazy grandmother since his parents died, and spends most of his time on his smart phone. However, after an accident involving him being beaten by a vampire, he realizes that he is immune to their bite. Furthermore, he learns that his parents were vampire hunters, working for an underground organization called Vampire Cleanup Department, who pose as garbage men but actually are experts in battling vampires. Because, obviously, Hong Kong is soaring with them. Soon after his experience, his uncle Chau introduces him to the service and Tim finds himself being trained by the other members of the group, including Chung, the central fighter, and Master Ginger, a priest who specializes in talismans. However, during his first mission with his new comrades, he ends up underwater kissing a female vampire, reinvigorating her into an actual and very beautiful girl. Furthermore, and after a peculiar series of events, he and the girl, whom he calls Summer, start living together and even having feelings for each other. His actions, though, are completely against everything he was taught. Yan Pak Wing and Chiu Sin Hang direct a very entertaining film, whose main purpose seems to be to mock and parody everything we know about HK horror movies, to say the least. The concept of the jumping vampires with their hands stretched out is mocked in every way possible, but particularly from Summer's character and her "relationship" with Tim. The scenes where he walks around in the streets, having a woman who looks normal otherwise, but jumps instead of walking, is a distinct and hilarious sample of this trait. Furthermore, the training session obviously mocks "Karate Kid", and particularly the wax on-wax off sequence, the whole concept of the team seems like a parody of "Ghostbusters," and the directors even mock the initials of the team (VCD) in a scene where Tim compares it with DVD and Blu-Ray. Overall, the fact that they do not take their theme seriously at all seems to benefit the movie, which retains a preposterous but at the same time very funny style. The only fault comes during the ending of the film, where they try to insert some dramatic moments, which seem completely out of place. This, however, lasts for a very short time, and does not fault the general sense of the production. The action scenes move at the same preposterous paths, but some gore and a number of SFX work quite well, particularly in the battle at the end. 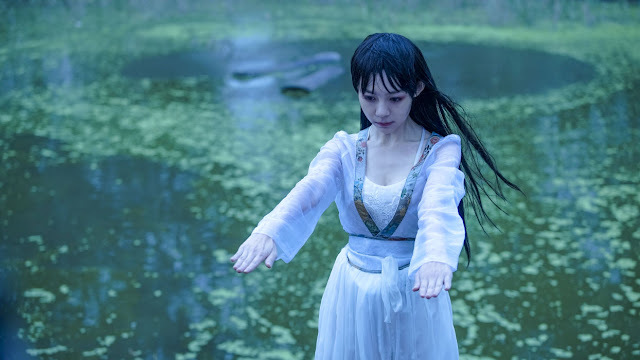 Choi Ko- bei's cinematography seems to fit the general aesthetics of the film, with the images of the different settings highlighting the nonsensicality of the story. Some abrupt close ups and Tong Wai-wing's editing intensify this sense, while the latter retains a rather fast pace that benefits the movie's general style. The story demands from the actors to act mostly as caricatures, and in that fashion, they succeed to the fullest. The one who seems to stand out, however, is Lin Min-chen as Summer, who functions as a weird, quirky, but very beautiful doll. Furthermore, the presence of a number of veterans of HK cinema (Chin Siu-ho, Eric Tsang, Richard Ng) works quite well, particularly in the comic aspect. Babyjohn Choi as Tim plays the role of the heroic clown quite well. 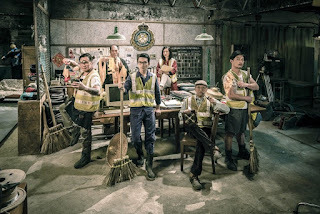 "Vampire Cleanup Department" is a very entertaining film, a great sample of HK comedy, which also functions, on a secondary lever, as a parody to CAT III films.